Col. Jacob Weiss was born in the city of Philadelphia. His father was a native of Germany, for many years a respectable physician in that city, and an ardent supporter of the American Revolutionary cause. The subject of this notice entered the Continental service in the first company of Philadelphia volunteers, commanded by Capt. Cadwalader, and, after having per-formed a tour of duty, he was, at the earnest recommendation of Gen. Mifflin, then acting as quartermaster-general, to whom he had served an apprenticeship in the mercantile line, and who knew him to be a trusty and proficient accountant, appointed a deputy quartermaster-general under him, and sub-sequently under Gen. Greene, in which station he remained until Gen. Greene took command of the Southern army, during which perilous times he was almost constantly attached to and followed the various and often sudden movements of the main army, which proved a very harassing and arduous service. By the advice of Gen. Greene, who, in his farewell letter to him, highly and affectionately commended him for the faithful performance of the various duties impressed upon him, he accepted the appointment as assistant deputy quartermaster-general at Easton for the county of Northampton, in the fall of 1780, in which capacity he served until the close of the war. After the defeat of the American army in the battle on the river Brandywine, Sept 11, 1777, the road to Philadelphia was open to the enemy. There was great consternation among the people when they heard of the approach of the British. Mrs. Weiss frequently spoke of the excitement that followed. Every one tried to get away. Fabulous prices were paid for all kinds of conveyances. Her husband was with the army, and she was left to her own resources. She was fortunate in procuring the services of a team, and, taking with her the wearing apparel of the family and a few articles of furniture, started with her family for Bristol. Upon her arrival there she found the hotel used as a hospital for wounded soldiers, the sight of which greatly distressed her. 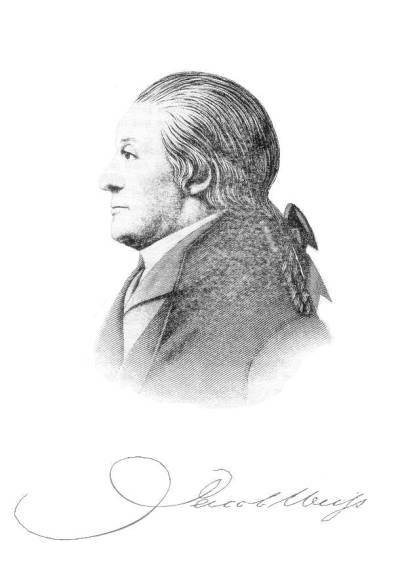 In the following month Col. Weiss sent his family to Easton, PA.
After closing up the business of his department in 1783, he retired from the public service, and purchased a tract of land from the Moravians, on the Lehigh River, north of the Blue Mountain, including the site on which Fort Allen formerly stood. To this wild and secluded spot he brought his family in 1785. The inhabitants were few and simple in their habits, unburdened by the restraints and conventionalities of modern life. Nor had they need of many of the things we now consider necessary to our health and comfort. An umbrella was considered a great novelty, and Mrs. Weiss at first attracted some attention by carrying one on a warm or rainy day. While the colonel's time was fully employed in attending to the various duties that claimed his attention, Mrs. Weiss did not so readily adapt herself to the situation; she missed the society of congenial friends, the church to which she had been accustomed to resort on the Sabbath, and the school which her children had attended. Within the enclosure around Col. Weiss' dwelling was a well dug inside of the fort erected here by Dr. Franklin, remaining as a memorial of the old Indian war, and an evidence of what "Poor Richard" knew about digging wells. While contending with a soil by nature rocky and sterile, the early settlers were also frequently subjected during the growing season to severe frosts, generated by the humidity preserved by the shade of the forest, so that farming operations were only moderately successful. Besides farming, the lumber business claimed a large share of the colonel's attention. Under his energetic management the flats around his dwelling and the adjacent hills were rapidly cleared up and brought under cultivation, and the surrounding forest furnished an abundant supply of lumber for his mills. While thus engaged in transforming these savage haunts into the peaceful abodes of civilized life, he probably realized the fact that "peace as well as war has its victories." Owing to the steep mountain-sides and the rapidity with which the smaller streams, discharge their waters into the river during heavy rains or the rapid melting of the snow upon the mountains, the valley of the Lehigh is liable to sudden and destructive floods. On the night of Oct. 6, 1786, the family were aroused by the cry that they were surrounded by water; the colonel upon raising the window beheld to his dismay the whole flat overflowed. What increased the alarm was that there had been no heavy rain in the vicinity. In the darkness of the night the waters could be seen to rush wildly by, and steps were immediately taken to remove the family to a place of safety. Teams were hastily harnessed, and after much difficulty and danger they reached the hills. Not so fortunate were the occupants of an adjacent dwelling, occupied by a man named Tippey and his wife and two children, which was carried away by the flood, and lodged among the trees of an island about one mile down the river. Tippey and his wife saved themselves by clinging to the branches of a tree, but their children perished in the flood. This flood was afterwards known among the people of the surrounding country as "Tippey's Flood." In the year 1791 an event occurred, in itself apparently trifling, but destined in the near future to work a mighty change in the wild and solitary region of the Lehigh lying to the north of the colonel's home. This was the accidental discovery of coal by Philip Ginter, a hunter, who observed it adhearing to the roots of a tree which had been blown down as he was tramping over the mountains in search of game. As he had often listened to the traditions of the country of the existence of coal in the vicinity, it occurred to him that his might be a portion of that "stone coal" of which he had heard, and the next day he carried it to Col. Jacob Weiss. The colonel took the specimen to Philadelphia and submitted it to the inspection of John Nicholson and Michael Hillegas, Esqs., and his brother-in-law, Charles Cist, who ascertained its nature and qualities, and authorized Col. Weiss to satisfy Ginter for his discovery upon pointing out the spot where he found the coal. Hillegas, Cist, Weiss, and some others formed themselves into the "Lehigh Coal-Mine Company," and took up about eight or ten thousand acres of, till then, unlocated, land, embracing the principal portion of the coal-lands now owned by the Lehigh Coal and Navigation Company. The mining operations of the company, however, were not successful, and the mine remained in a neglected condition for several years. Between the coal-mine and the distant market lay a vast expanse of mountainous country. The Lehigh River, in its then unimproved condition, seemed to offer insurmountable obstacles to any attempt to float anything much larger than a canoe over its rapid current and rocky bed. Col. Weiss, notwithstanding the inauspicious outlook, determined that the coal should, at least, be introduced to the acquaintance of the public. Ox-teams were brought into requisition, and several loads were hauled across the mountains to the Mahoning and thence to Fort Allen. The writer often heard his father speak of the difficulties encountered in these attempts to haul coal across the mountains; the ascent of the mountains was less difficult than the decent; in the latter case it was necessary to fell large trees and attach them to the wagons to prevent a runaway. But Col. Weiss was persistent in his determination to bring the coal into use, and would fill his saddlebags with the despised substance and ride around among the blacksmiths of the country earnestly soliciting them to try it. A few accepted the proffered gift, and used it with partial success, others threw it aside as soon as the colonel was out of sight, with the remark that he must be crazy (it has been suggested that as these early pioneers were unfamiliar with the nature and character of anthracite coal, some of the coal selected may have been "stone coal", and that offered the public may have been, not only in name but in fact, "stone coal"). The Coal-Mine Company, desirous of rendering their property available, granted leases to several parties successively, only to be abandoned in turn when the difficulties and losses of the enterprise became manifest. Not until the Lehigh Coal and Navigation Company took hold of the enterprise was the coal sent to market in sufficient quantities and at prices which at length attracted the attention of the public. Some threescore years have passed since the silent solitudes of the Upper Lehigh were broken by the busy hum of industry, and an heretofore untamed mountain-stream was made subservient to the purposes of commerce; the marvelous transformation which has since taken place not one of the early pioneers in their prophetic visions could have foreseen. It was beyond the grasp of their philosophy. That wonderful creation, a modern locomotive, capable of moving a train of loaded coal-cars more than one-third of a mile in length at the rate of ten or fifteen miles an hour, had not yet been evolved from its germ. Nor could they have had any conception of the marvelous extent of the coal formations. Geology was then in its infancy. They spoke of the Mauch Chunk Mountain as a solid mass of coal, and upon a report reaching the public that the miners had reached the bottom of the mine at Summit Hill the stock of the Lehigh Coal and Navigation Company fell twenty per cent in the Philadelphia market. Col. Weiss had the misfortune of being deprived of his eyesight about twenty years before his death, and also becoming extremely deaf, misfortunes which he bore with great resignation. He was a man of liberal education, strong mind, remarkable memory, and generous disposition. He died at Weissport, Jan 9, 1839, in the eighty-ninth year of his age, and his widow, Elizabeth Robison Weiss, survived him nearly six years, and died Nov. 29, 1844, reaching the ripe age of ninety-one years. The children were Francis, born in Philadelphia, March 7, 1773, who followed the business of surveying; never having married, he resided with his father at the old homestead; he died March 5, 1845. Rebecca, born April 9, 1774, married William Hartfield; died at Bethlehem, Feb 14, 1845. Jacob, born Aug 18, 1775, spent many years in the mercantile business, first in Luzerne and later in Schuylkill County. Thomas was born in Philadelphia, Aug 29, 1776. His early years were spent in Easton and Nazareth. After attending school for several years at the latter place he was apprenticed to a hatter; after serving out his apprenticeship he abandoned the business in disgust and took charge of his father's farming and lumbering business, which he conducted with energy and skill. He was especially active in commending the common-school system to the farmers of the surrounding country, soliciting their sympathy and support in the cause of education, for it may not be generally known at the present day that much opposition manifested itself to the introduction of the common-school system among the German population. After the completion of the Lehigh Canal he, in connection with his brother Francis, laid out the town of Weissport, locating it on the broad flat lying between the river and canal, having a general elevation of from ten to fifteen feet above the river in its ordinary stage. True, the site selected had once been overflowed by an extraordinary flood, known as "Tippey's Flood," some forty odd years before, but this began to be looked upon as one of those rare occurrences which would probably never be repeated. But after the destructive floods of 1841 and 1862, people began to realize the fact that a safer location for building purposes might be desirable, and the growth of the town has since been very much retarded. Thomas Weiss married Miss Maria Soldt, daughter of Paul and Mary Soldt, who resided about three miles from Fort Allen, being among the early settlers of Big Creek. Sept 15, 1806, they took up their abode in the dwelling standing near the house of Col. Weiss, which they occupied to near the close of life; here were born their children, - Rebecca (married to Dr. John D. Thompson), Elizabeth (widow of Jacob Bowman, now residing at Millport, Carbon Co.), Lewis (residing at Lehighton), Charles (who died at Weissport, Jan 2, 1818), Francis (now residing at Bethlehem, and the only member of the family who engaged in the coal business since his grandfather's early attempt to distribute coal in saddle-bags), Edward (who died at Mauch Chunk, Aug 6, 1866, whose widow resides in Franklin township, Carbon Co.), and Alexander (now residing with his family at Los Angles, Cal.). Thomas Weiss died at Weissport, April 23, 1847. His widow survived him about eight years, and died July 31, 1855. Their descendants in 1879 numbered one hundred and sixty, to wit: eight children, forty-nine grandchildren, eighty-three great grandchildren, and twenty great-great-grandchildren; of these, four children, thirty-seven grandchildren, sixty great-grandchildren, and sixteen great-great-grandchildren were living in 1879.